The Euro, a United currency, which is in use in several European countries. The agreement on the introduction of the single currency greatly simplified trade relations between them: indeed, since to pay in stores, for example, in Germany and France was possible the same bills. Having agreed on the introduction of the single currency in the Eurozone, the countries that have adopted such a solution, put into circulation currency called the Euro. This occurred on 1 January 1999. To indicate the entered currency was adopted the English spelling of "euro", but in the language of the majority of countries there is a national symbol of this currency. At present, the Euro is in use in 18 countries within and outside the EU, and the total money supply in circulation is almost a trillion euros. However, a number of countries in the EU have not abandoned their national currency and not adopted the Euro: for example, these include Sweden, Czech Republic, Latvia and 7 States. In this regard, in addition to the term "European Union", decided to allocate the concept of the Eurozone, which unites 18 countries where the Euro is the main means of payment. 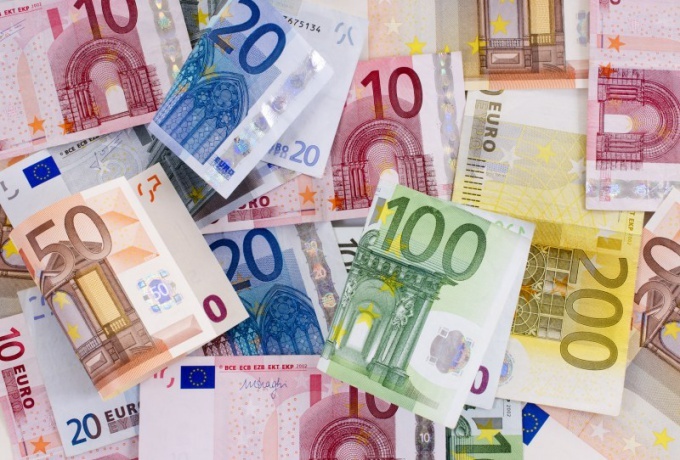 The Euro is issued by the Central banks of the EU States in the form of coins and banknotes. The banknotes in circulation in Europe, have seven different denominations. So, the smallest banknote in circulation at the moment is 5 euros. The maximum denomination is 500 euros. Besides these bills, banks also issued banknotes with denominations of 10, 20, 50, 100 and 200 euros. It is noteworthy that, while banknotes are printed in different countries, all Central banks use the same design of the banknotes from both sides of the monetary unit. With the large bills with denominations of 200 and 500 Euro are not available in all countries. However, to pay them, even in those States that do not print banknotes of such face value: in fact, at the moment, no matter what country issued or that bill. One Euro is segmented into 100 smaller units called cents. They are widely used for the implementation of small purchases, therefore, are issued only in the form of coins. So, today in circulation are coins of 1, 2, 5, 10, 20 and 50 cents. In addition, there are coins in denominations of 1 and 2 euros. Interestingly, the coins issued by different Eurozone countries, have only one the same side on which the face value and a stylized map of Europe. The other side is used for the application of various national symbols and therefore varies between different countries. However, any restrictions on the use of such coins in other States does not exist.